Consumption of coffee, one of the most popular beverages around the world, has been associated with a lower risk of cardiovascular and all-cause mortality in population-based studies. However, little is known about these associations in patient populations. This prospective study aimed to examine the consumption of caffeinated and decaffeinated coffee in relation to cardiovascular disease (CVD) mortality, ischemic heart disease (IHD) mortality, and all-cause mortality in patients with a prior myocardial infarction (MI). We included 4365 Dutch patients from the Alpha Omega Cohort (read more about the AOC population here). At baseline (2002–2006), dietary data including coffee consumption over the past month was collected with a 203-item validated food-frequency questionnaire. Causes of death were monitored until 1 January 2013. 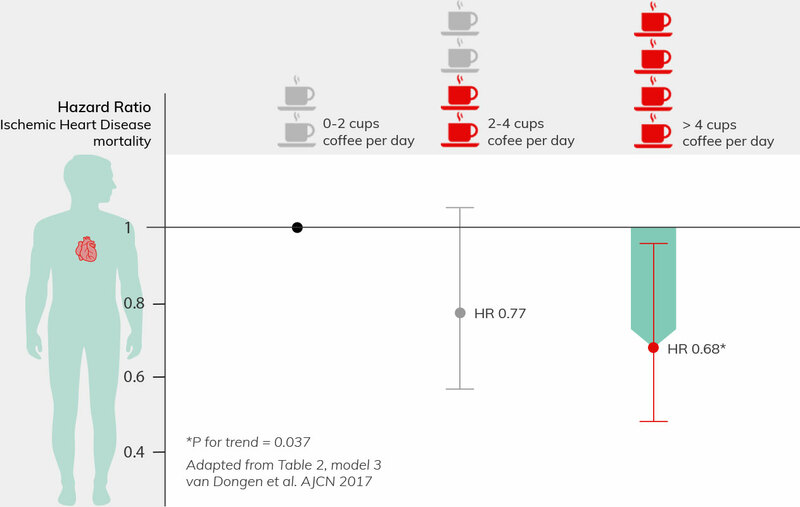 HRs for mortality in categories of coffee consumption were obtained from multivariable Cox proportional hazard models, adjusting for lifestyle and dietary factors. Most patients (96%) drank coffee, and the median total coffee intake was 375 mL/d (∼3 cups/d). During a median follow-up of 7.1 y, a total of 945 deaths occurred, including 396 CVD related and 266 IHD-related deaths. Coffee consumption was inversely associated with CVD mortality, with HRs of 0.69 (95% CI: 0.54, 0.89) for >2–4 cups/d and 0.72 (0.55, 0.95) for >4 cups/d, compared with 0–2 cups/d. Corresponding HRs were 0.77 (95% CI: 0.57, 1.05) and 0.68 (95% CI: 0.48, 0.95) for IHD mortality and 0.84 (95% CI: 0.71, 1.00) and 0.82 (95% CI: 0.68, 0.98) for all-cause mortality, respectively. Similar associations were found for decaffeinated coffee and for coffee with additives. To conclude, drinking coffee, either caffeinated or decaffeinated, may lower the risk of CVD and IHD mortality in patients with a prior MI. The consumption of filtered coffee was associated with a 20–30% lower risk of CVD and IHD mortality. The inverse associations were present both for caffeinated and decaffeinated coffee and for coffee with and without additives. No association was found for CVD and All-cause mortality. Laura H van Dongen, Famke JM Molenberg, Sabita S Soedamah-Muthu. Daan Kromhout and Johanna M Geleijnse.